Given his athletics background it's small wonder the 24-year-old has developed into an aerial threat on the court. The slam-dunk specialist's displays have generated an online following, with one highlights reel attracting almost 10,000 views. "It's nice to get that recognition. I love it," he said. "I hope it will last because that kind of athleticism seems to fade off as soon as you get into your late 20s. I'll make the most of it while it still happens." Though Murphy was underage national high-jump champion, he admits he struggled at senior level, prompting him to focus his attentions on basketball. "I was doing about 1.96m, underage, and I wasn't really increasing," he recalled. "These guys now they'd be on 2.10m plus just for qualifying. So unless you're around the 2.05m to 2.10m mark you're not really competing. My high-jump technique was lacking. I was getting all the raw explosiveness and power from the basketball I was playing. My actual high-jump technique was a shambles in comparison to these other guys." The Wicklow man's talents translated well to the 100m and 200m during his school days but was less suited to cycling, a passion of his father Mark, who is Bray Wheelers chairman. Suitably for the point guard (right) known for his creative displays, he completed a degree in Visual Art, covering everything from contemporary art, sculpture to video, at Dún Laoghaire's IADT last year. "My focus was mainly in photography and film. There's a lot of technical elements but that's definitely more of a hobby of mine, than a professional thing. I enjoyed it," he said. "You might think something looks great but compared to the industry standard, you realise how s*** you actually are. "I'm kind of taking it easy this year, doing some coaching but I'd love to go back and do a Masters, hopefully in something more art-related. Perhaps in the education side of it." 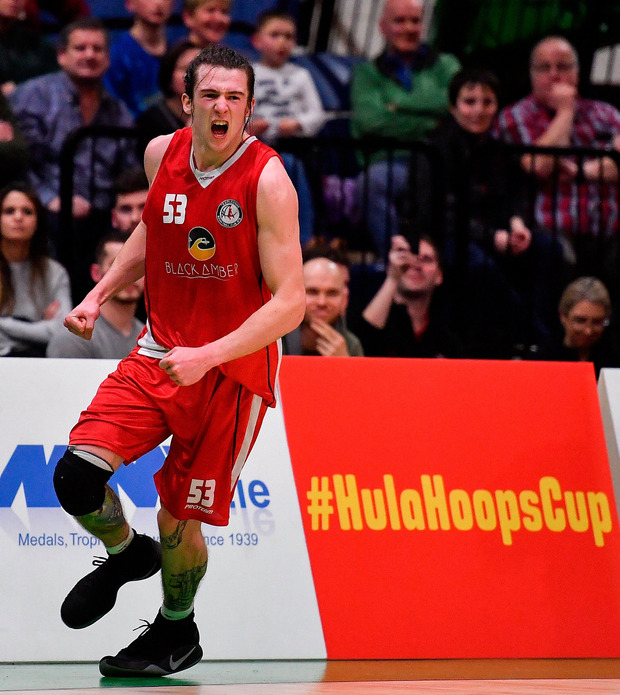 He aims to put his creative spark to good use tomorrow as Templeogue bid to end their Champions Cup run of bad luck, having been beaten by Tralee Warriors in the past two finals. "The semi-final doesn't seem to bother us, it's always the final," Murphy lamented. Belfast knocked out reigning champions Tralee in the semi-finals but the Ulster men are yet to beat the Dublin side this season. "We met them early on in the season. They had a lot of new guys that hadn't quite got together yet. Both times we played them they were very good, quite a physical team," Murphy recalled. "Mike Davis, their American, he's scoring high 20s all the time so he'll be a man to watch." Curbing Davis' influence may help two-time Cup and League winner Murphy to the only national title missing from his trophy cabinet tomorrow.